Posts and other content that look at all things fishing in general, salt water and fly fishing. Kirk Deeter, of Field &Stream, wonders whether the fishers of tomorrow are getting the right message. “I gave another elementary school talk the other day, and was once again blown away by the enthusiasm 10-year-olds have for fishing. They asked many great questions, but there was a pattern that left me feeling concerned. 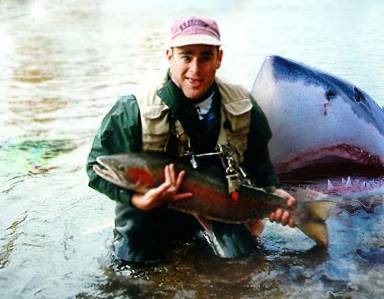 Extreme fishing: from Vladimir Putin to Robson Green, sport at its most macho, or is it? Here we go with some wit and wisdom wrapped around fishing – quote numbers 1151 – 1155. Now 1155 fishing quotations here. The ‘UK Grip’ – A Trout Killer Too! Some people who read my recent article on ‘grip and kill’ when taking photos of trout have pointed out the style of grip shown above – I call it the ‘UK grip’ and it can be lethal. Those who follow UK trout fishing magazines and websites may have noticed the prevalence of photos with the trout being held as seen in the photo above. I did a quick flick through a pile of recent top selling UK magazines and websites and as rough estimate well over 50% of fish are held by the UK grip. I believe trout are held this way to show off the fact that the fish is a ‘full-finned’ or wild fish, not a stocked fish. Many (most?) stocked fish have their tails and fines damaged by other fish and the concrete walls of the stock pens. So to show off the fact the fish is ‘full-finned and tailed’ you need a grip that does just that. That grip which I have called the ‘UK grip’ is great for showing fins and tails, but is it good for the trout? No. The UK grip means that the tail of the fish is not firmly held by fingers encircling the base of the tail – to do so would ‘hide’ the tail. So the holder must squeeze the fish as shown above. If the fish thrashes about the grip around the heart area has to increase. All bad news for the heart and other organs. This practice needs to stop, and fishing media can stamp it out almost immediately. Magazines and websites need to stop showing fish held in this way. We all should know the rules for releasing a trout with the best chance of survival, but there is one rule that is almost never included in articles about successful releasing. So, you have landed the fish as quickly as possible to limit capture stress and you are about to pick up the fish and a get a few ‘grip and grin’ shots before release. But, grip and grin, can all too often turn into grip and kill, and it is all down to where you grip, and how you grip, the trout that can determine its survival. Link corrected – Read the full story and see the grip and kill photos. The worst example of ‘grip and kill’ in these shots – almost certain lethal damage to heart, liver and gills. Spectacular imagery, featuring giant Pacific mantas and professional mermaid-model Hannah Fraser. During her many breath-hold dives, which often lasted a minute or more, Fraser had one ankle anchored to the sea floor with 50 pounds of weights, which enabled her to sway with the current, 30 feet beneath the surface. In summer killer whales are a regular sight in the Hauraki Gulf, Auckland, New Zealand. They come inshore to feed, predominately on sting rays. In this amazing video watch the Orcas get up close and really personal with a guy fishing off a jet-ski. In my ten years owning Just Fishin’, here in Auckland, NZ I heard some truly dumb questions, but neglected to write them down, this blog did. 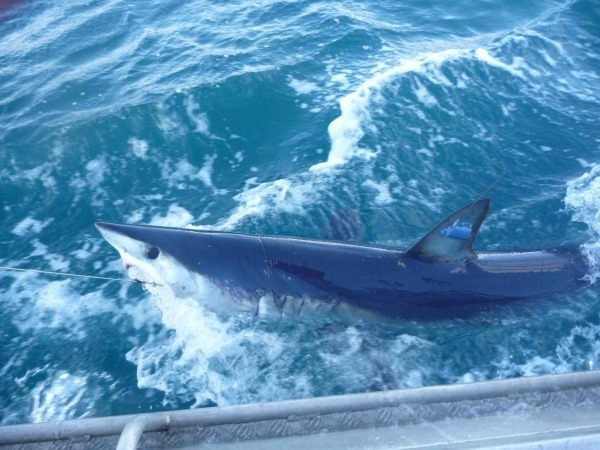 A satellite reporting tagging device know as a SPOT tag, attached to a shortfin mako shark dubbed “Carol” in New Zealand five months ago, is providing scientists with remarkable and previously unknown details of the timing and long-distance migratory movements of this species. See more on Sportfishing magazine.